Over the years I have been asked if there is such a thing as food addiction. First, let’s look at what is an addiction? Here is one definition: An addiction causes people to engage in a recurring activity that causes harm to the person. It is often described as a compulsion to engage in some specific activity to produce mood-altering experiences, and this experience has life-damaging consequences. Addictions often have both physical and psychological components. There is discomfort upon quitting the addiction. Most people would not overindulge in anything that hurts them physically, emotionally, mentally or spiritually. With addiction, one or more of these areas are negatively affected. Does your eating behavior create a problem in your life, but you continue to do the same thing over and over? Do you eat to change how you feel? Do thoughts of food, weight and body size enter your mind at unrelated times? Do you feel out of control with your eating? Are you afraid to start eating something because you are afraid you cannot stop? Do you obsess about eating certain foods? Do you find yourself eating when you had resolved not to eat? Do you eat more than you want to? Do you use other activities or substances to stop your eating behaviors? Not long ago, there was a potato chip ad that challenged, “Betcha can’t eat just one!” Many took on the challenge and lost. Food manufacturers have done an exquisite job of recognizing and tapping into our cravings. Why does this challenge some of us and not others? It is a widely accepted fact that some people are more susceptible to becoming addicted than others. Some have a hereditary disposition to becoming dependent on mood-altering substances. Sometimes people are self-medicating, stuffing their feelings or are deficient in emotional regulating skills. Any behavior engaged in repeatedly can become a habit. A habit is simply an activity that you do so often that it becomes a part of your routine. Most people observe that any activity repeated for about a month becomes a habit. It is important to be aware of the habits that we are forming. This can be used as a positive, life-enhancing activity or the building blocks of an addiction. Even our thinking becomes habitual. Our negative self-talk can become so well established that we don’t even realize that we are beating ourself up or that it is having an effect on our life. It takes work to create a good habit, but it makes life easier. Bad habits are easily formed but make life harder. I have never met a client who was addicted to broccoli. Why? Although broccoli is good for your body, it does not produce mind-altering effects like some other non-foods. Isn’t it interesting that the most common food addictions are comprised of manufactured fats, chemicals, salt and/or sugar? It is important to note that broccoli and other whole foods usually are not addictive, but this list can be expanded. Looking at these items, we can see some similar ingredients – sugar, carbohydrates or white flour. Carbohydrates are our major energy-producing food. We need carbohydrates like vegetables, fruit, whole grains, nuts and beans. Note that different types of carbohydrates turn into sugar at different rates in your body. For addiction purposes, let’s look at refined carbohydrates. These are the ones that spike your insulin level, and then drop you onto the blood-sugar rollercoaster. Even the blood sugar drop causes cravings, bingeing, depression, lethargy, irritability and drowsiness. But there is more going on than just blood sugar fluctuations. During functional MRIs, scientists have observed that refined carbohydrates light up the reward system of the brain for some people – just like an addicted person using their drug of choice. It is a good idea to think it through when you are tempted to consume one of these products. Do I really want to feel that way afterwards? Do I want to battle the incessant cravings again? This is one rollercoaster I choose not to ride. There are too many other factors that occur that triggers overeating. There is one sure way to eliminate this physiological response. Don’t put these blood sugar spiking foods in your mouth. Food addictions can progress to other addictions, starting with appetite suppressants and diet pills. Many patients at Rebecca’s House Eating Disorder Treatment Programs have progressed to methamphetamines, cocaine, speed and heroin to curb their appetite and stay skinny. There are many forms of addictions, but let’s look at how we may be addicted to a few commonly ingested legal substances. Alcohol is probably a good place to start. Many people do not have a problem with alcohol, and they can drink normally without any consequences. They don’t obsess about it or try to control their intake. It has no power over them. Then there are others who become alcoholics. They will tell you of the constant thinking about drinking, not drinking, getting their next drink or recovering from the effects of their last bout of drinking. This is the hell an active alcoholic lives with. The person may quit drinking only to find the obsessive thinking and surfacing feelings are too much to bear. Is this anything like our compulsion to eat? Have you experienced that numbed out feeling during eating? Do you eat to make the feelings or thoughts go away? When something upsets you, do you look for comfort in food? I have had people tell me that they are thinking about food, weight, diets, body image, exercise, and so on about 95% of their waking hours. Does this make sense? Not for someone who has no problem with food. However, if you are trapped in the obsession of a food addiction, you know what I am talking about. Does eating really fix the situation or feeling, or does it often compound the problem? Over the years, I have seen a great number of people recover from alcoholism only to switch to a food addiction. They use food in a similar way to how they used alcohol. I don’t need to go into the debate of which is better; I just want to point out the similarities. 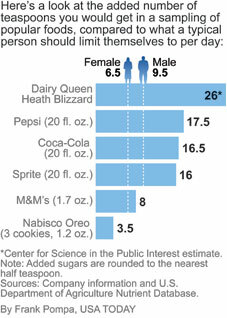 I especially see people who are recovering from alcoholism also being addicted to sugar. That makes so much sense. Alcohol is metabolized in the body as sugar. Although it may not have the same devastating effects short-term, sugar can and does kill. Refined sugar is in almost everything now, even in some brands of potato chips! You can get scientific articles about sugar addiction and download a Sugar Awareness assessment at www.SugarAwareness.com. If you can relate to any items discussed in this article, you can get a free eating disorder assessment by calling 800-711-2062 or visit www.RebeccasHouse.org. There are videos and articles about eating disorders, dieting, and food addictions at www.RebeccaCooper.com. If you are having problems with yo-yo dieting download the Diets Don’t Work eBook here.